Custom analysis of individual IT purchases to assure you’re getting a good deal. As you’re negotiating IT purchases and renewals, do you wish you had a way to validate whether you’ve got a good deal? NPI’s subscription service for IT price benchmark analysis and negotiation intel – SmartSpend™ for IT Buyers – is designed specifically to fill that need, and more. Add it all up and enterprises overpay for more than 75% of their IT purchases! That’s a problem that needs to be fixed. Overcome these challenges and level the playing field by arming your IT buyers with transaction-specific IT price benchmark analysis, negotiation intel and licensing expertise. That’s actionable information your IT buying team can use to assure you’re getting the best deal purchase-by-purchase. For 16 years, NPI has been helping companies eliminate transactional overspending and liberate IT budget dollars that can be redirected to other projects or to the bottom line. We regularly achieve 7-figure savings with clients through attainment of best-in-class pricing and terms as well as best-match licensing/program selection. 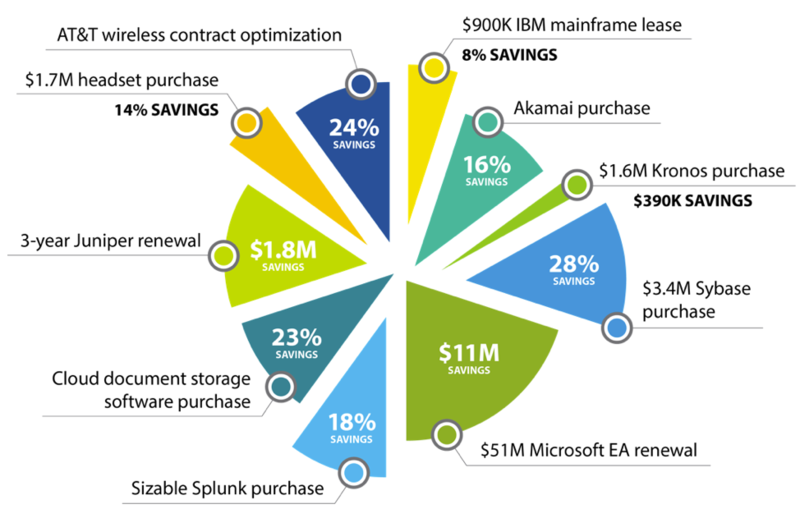 How Does the SmartSpend™ for IT Buyers Subscription Work ? When you subscribe to SmartSpend for IT Buyers, our team of consultants and vendor-specific subject matter experts will perform a custom analysis of your day-to-day purchases. Simply submit purchase quotations as they occur throughout the term of your annual subscription. We’ll return custom Fair Market Value Reports specific to your transactions, and an NPI consultant will personally walk you through the findings. Over 75% of the purchases NPI analyzes reveal material savings opportunities. Armed with our custom FMV Reports, clients are capturing millions of dollars in savings, and more value for every budget dollar spent. NPI also provides IT sourcing seminars and workshops for subscription clients to enhance skills, knowledge and alignment across all stakeholders on your IT buying teams. Which IT Vendors Does NPI Cover? IT consultant rate cards are another spend subcategory that is frequently analyzed for clients. Top submissions include Accenture, Ernst & Young, KPMG, Tata and Capgemini. It’s important to note that our approach to research and analysis accommodates common industry leaders as well as emerging entrants. Our vendor coverage expands in lockstep with client purchase patterns. Empowering our clients with transactional analysis. NPI provides precise, actionable findings and recommendations – in writing. They reflect vendor-specific subject matter expertise, price benchmark analysis, and first-hand knowledge of peer buyer experiences. This level of service is what sets NPI apart from the competition and empowers our clients to get the best deal on every IT purchase.